The fragrance features three contrasting harmonies: a bubbling, explosive surface; and sensual textured depths. Citrus notes of mandarin orange zest, enhanced with bergamot, yuzu and sweet orange, give way to an astringent spice combination of camphor, cardamom, cinnamon, nutmeg and saffron. These are freshened with blue water lily which adds an ozone-like note with a black incense, ambergris, benzoin and papyrus wood essence feature in the deep, woody dry-down. 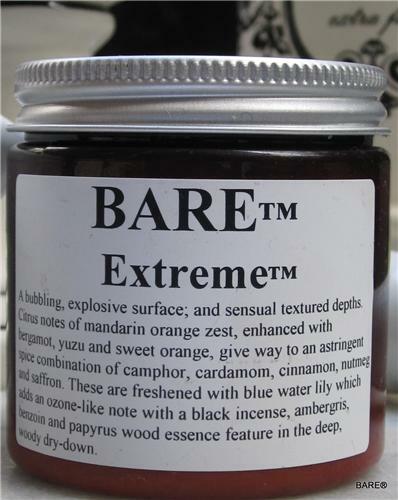 BARE "EXTREME" (unisex)* Body Butter is a traditional beeswax and borax body butter with origins dating back 100 Years. Over 98% natural, highly emollient and having over 50% oil content. Historically, this was called night cream or waterless cream in Eastern Europe. Sunflower Seed Oil, Soya Bean Oil, Jojoba Seed Oil, De-Ionized Water, Natural Beeswax, Emulsifying Wax NF, Sodium Borate, Aloe Vera Leaf Juice, Fragrance, Chamomile, Disodium EDTA. Phenoxyethanol and Caprylyl Glycol.